Dragonfly (4) spent one afternoon playing with homemade play dough and carefully cutting it into bunches of tiny pieces. 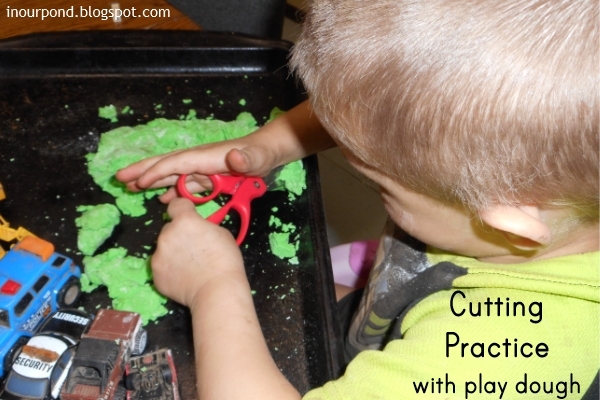 The play dough was peppermint scented, so it made the house smell really nice. This was Skimmer's first time using scissors. He did very well. 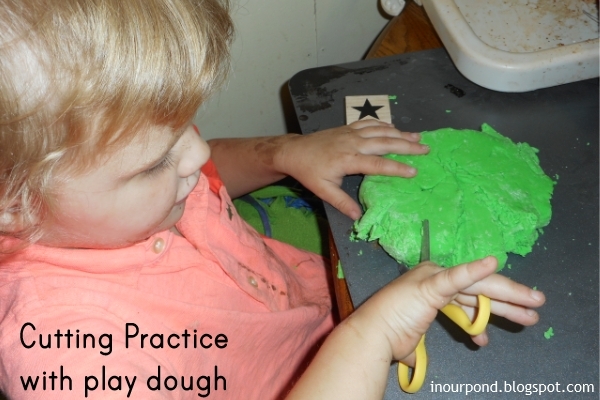 He also enjoyed running his trucks through the dough and making tracks. 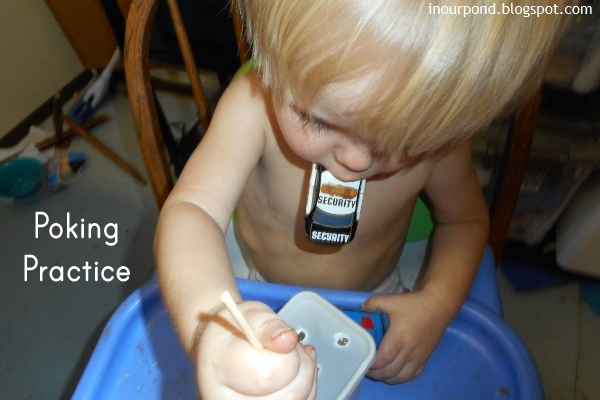 While the other two were cutting play dough, Skimmer (22 months) learned to poke sticks into holes. The container is a Walmart brand crystal lite drink canister. He put the sticks in and dumped them out. Putting the lid on was challenging for him because of its shape. He did the whole series of activities with the car in his mouth because he was afraid that his brother would steal it if he set it down. 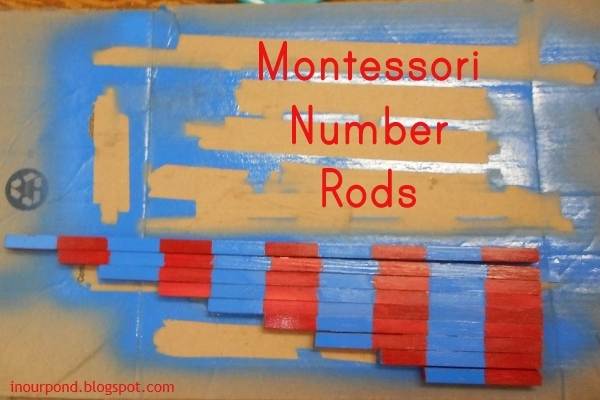 I finished my Montessori-inspired Number Rods this week. Slowly, I'm getting us all set up for the next school year. The rods are half inch dowel rods cut down to increment lengths from two inches to twenty. True Montessori Number Rods are done in graduated sizes from ten centimeters (about 4") to one hundred centimeters (or 40"). Our "Pink Tower" arrived this week. Here is Tadpole stacking the blocks by size. 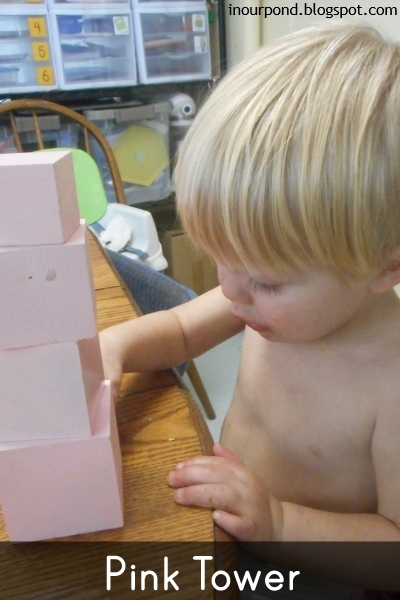 He found so much satisfaction in building the tower and giggled every time he completed it. As his parent, it was really fun to watch. 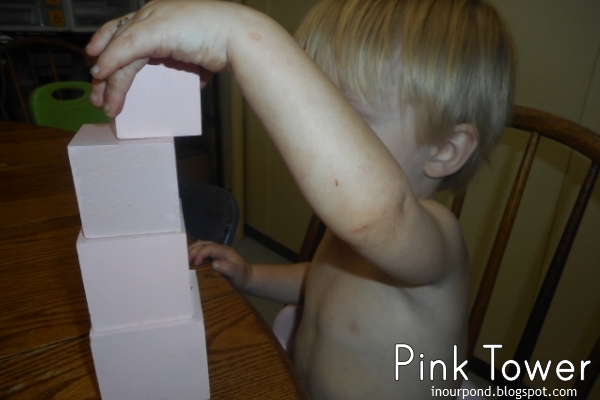 This is another picture of Tadpole working with the tower. The table isn't the ideal place for him to build, but it did help he and his siblings take turns with the new "toy." I love the car in the mouth to keep it "safe" from sibling. This is a very important skill for survival, knowing how to keep your items safe.